The Made To Order service Games Workshop has been running for the past year is both insidious and incredible. On the one hand it eats cash I should've kept in my account on the other it gives access to models I've always wanted at prices below e-bay crazy. An example of this is Grom the Paunch, the model I just finished painting. Grom the Paunch is one portly psychopath. This Warhammer Character is a real classic. A lazy check on Warhammer Fantasy Wikia sources him to the very recent 8th edition army book and the Warhammer Invasion card game. This does not do Grom the Paunch justice. He can actually be found in an earlier incarnation in the old (eighties) Citadel Journals (as Crom). Stuff of Legends has the full '84 backstory of Grom's Goblin Guard, back when the fat half-goblin was still on foot (and had ogre DNA instead of troll). Yes he was a leader of one of the original Regiments of Renown. I have mentioned my liking for big banners before. 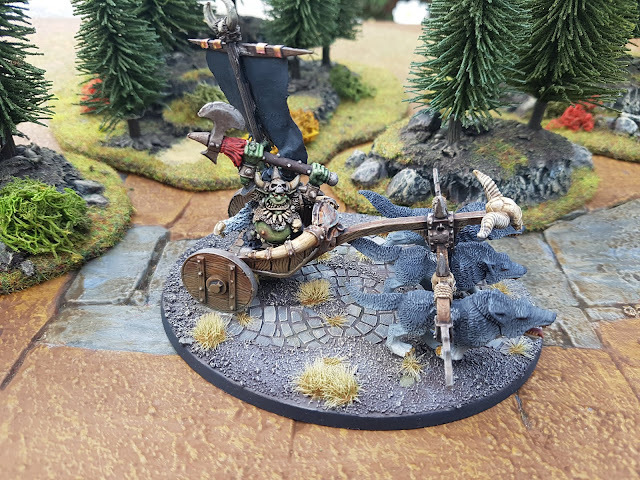 The chariot model of Grom is a bit more recent and (going by original GW painting pictures) it is at least at the tail end of the 'red period'. A (in my very humble opinion) sad period where every spear and most other pieces of wood where painted a very bright red (and every wizard carried a massive two-handed sword capped with skulls). I decided to go for a more gritty paint job (using this tutorial for the skin and this one for the wolves). As I was perusing (pdf's of) ancient Citadel Journals I decided to hit the print button on a page called 'Baneful Banners' and try an old trick. The above banner is printed on regular printer paper. I painted the back in my favorite black (German Grey) and the front with Vallejo Sepia (to utterly destroy the papery look of the thing). Then I covered it in PVA both for strength and to make the paper look slightly thicker. After this was dry I smacked myself on the forehead as I realized I should've used a lighter to improve the shape of the banner before adding PVA. I then used a pair of scissors and a lighter on the PVA covered paper to burn down the bottom of the banner far enough to make the second goblin's head stick out (and the sides to make them look cool). As a happy little accident the molten PVA actually gives a rather cool worn look to it all. I finished by sticking the banner to a painted toothpick and I glued it to the banner pole. I think the result is incredible. Painting the back of banners is easy, just smear them with black (or German Grey). There is one oddity in the design of the Grom chariot. If you stick the banner bearer in the prepared hole, his face vanishes behind Grom's portly frame. As I was wondering about this a fellow Oldhammer enthousiast posed the very same question on the Facebook group. Turns out even the studio staff at the time wondered about this and decided to glue Niblit (the standard bearer) on differently. Who am I to ignore professional advice? I decided to leave the original hole uncovered as it doesn't really show up on the model when viewed normally (going by the above picture I should quickly smear some dryad bark or burnt umber in the hole as I see metal showing when viewed from that particular angel ;) ). All in all a wonderful model to paint. Now to find an excuse to use him on the tabletop...hmmm a goblin invasion of one of the realms maybe? Excellent work! Grom is a classic warhammer figure, and he needs to be in your army. 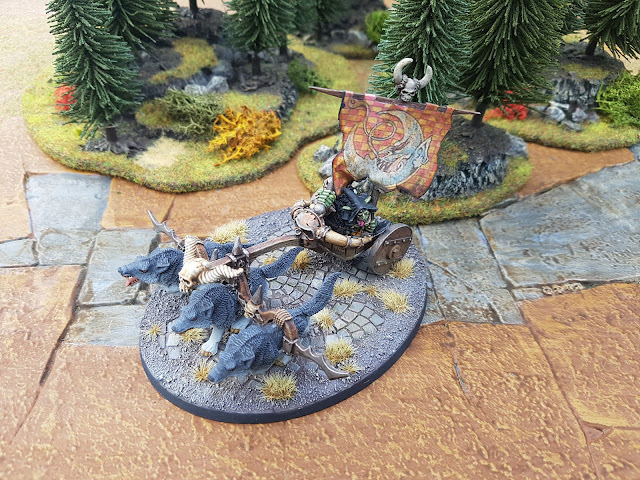 Using the oval bases certainly increases his total base size, but it looks quite a bit better than the old method of 50mm square for the chariot, and three wolf bases for the motive power! 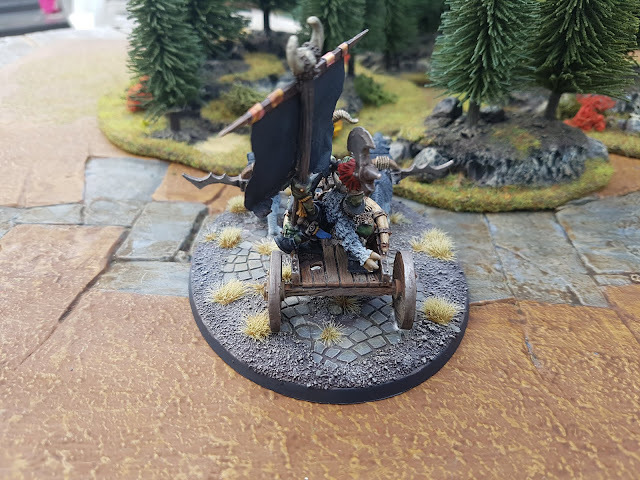 The only thing that could make the 3xcavalry+50mm base combination worse was the sad bit of cardboard people would use to glue the lot together :) If I was still playing with a square based wargame I think I would just go for a very large square base for this monster. I think he deserves it. Unless specified otherwise all text and images (c) Kalisti. Simple theme. Theme images by nicodemos. Powered by Blogger.